My heart sings when I am surrounded by pretty things, I don't want to own them, I don't even want to take them home, I just love being around them. One of my dearest friends, Virginia, has always loved pretty things and her table settings are always beautiful with lovely pieces from her Mother's home and always very pretty looking food, each course is prepared and decorated days ahead. It is always a treat to be in her home when she is entertaining. I'm lucky as she has thrown me quite a few Birthday lunches and they have always been very beautiful. This is not one of Virginia's tables but I couldn't help but think of her as I set this table last week. When Andrew and I are with friends or clients we are always shown the 'top drawer' so to speak of many homes ...and even businesses......Andrew is taken away to see Antique Furniture, hand crafted items and woodworking tools and I am shown.. well almost anything of beauty... Be it a garden, a beautiful vintage gown or a collection of something special. I also have so many people that come into my shop and tell me about their lovely things. It's always been part of my life and I really feel very special when they share their loved objects with me. I remember once when I was with Vogue Living a wonderful collection of Warner vintage fabrics had been found in old trunks in England and they had been distributed around the world to their agents to use as display. I got a call one morning from Warner Fabrics, saying, Coty, I know you will appreciate what has just arrived in our showroom and we would love you to come over and be with us as we open the trunk. As you can imagine, it was breathtaking, sample pieces, bolts of lace and hand painted papers....it was a treasure, even the trunk was beautiful and I was there with one other as we spent most of the day looking at everything. I was styling a home in the Southern Highlands a couple of weeks ago and the beautiful lady of the home was showing me through her dining room when I noticed this fantastic china setting and I asked her if she wouldn't mind if I did a tablesetting photoshoot. She was delighted!! So cupboards were opened and out came beautiful hand embroidered linens of her mothers from Venice, antique dishes, crystal glasses, silver, home made biscuits and the prettiest little cherubs. The Southern Highlands are well known for their gardens, the flowers and the seasons. As the sun was setting at the end of this summers day the light flickered through the crystal glasses. The softest of pink hand embroidered cloth immediately set the feel of the setting. A few roses, some hydrangeas and some freshly picked fruit created the centrepiece and one little cherub sitting in front of each setting. Magnificent magnolias are out at the moment, look as the colours of these petals and sadly we are seeing the very last of the hydrangeas for another year. Wishing you all a wonderful day, and of course a great Tablescape Thursday. and I'm also joining my beautiful friend, Rajee Sood, also a stylist and blogger in India for her Tea Party. Bring out those treasures, those wonderful old-fashioned pieces and use them with love, this is the most fabulous time of year to entertain, Autumn is in the air, the sun is soft and it's a lovely time to enjoy outdoors. Guess who is a cover girl? 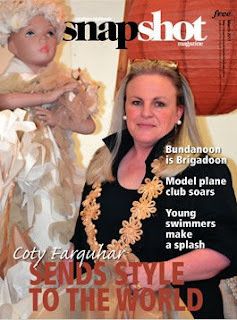 (part of our local newspaper, Southern Highlands News) have done a feature on my work and blogging!! flower images on the cover and not me!